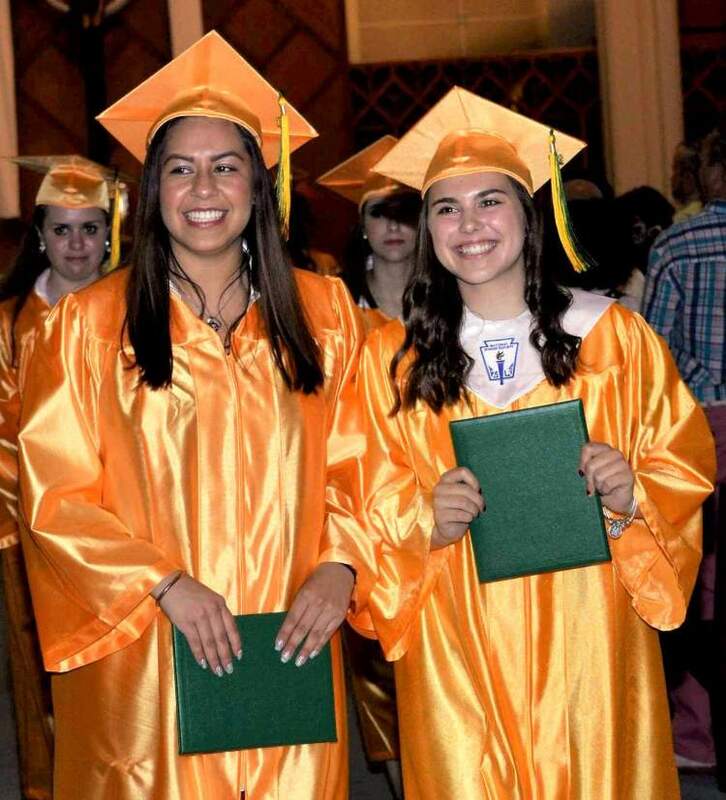 The dress code is traditional with Catholic education. All students are expected to adhere to the dress code policy at all times during the academic school day. While fads and fashion in dress change regularly, the school is committed to keeping to these traditional standards. Any articles which are not in keeping with these standards will not be permitted. If an emergency arises, the parents are to contact the administration and obtain prior approval for deviation from the dress code. Students are to arrive to school in full uniform. Students are expected to be neat in their appearance at all times. Repetitive, chronic, or extreme dress code violations may result in a student not being allowed to attend class and possible referral to the Discipline Board. The St. Edward Central Catholic High School prom is scheduled for May 5, 2017 aboard The Odyssey cruise ship in Chicago. This is a formal black-tie event for our junior and senior students, and we hope they all create positive, joyful memories on this special evening. Please click here to review the guidelines for appropriate attire. Acceptable Prom Attire: click here! NEW UNIFORM ADDITION FOR GIRLS AND BOYS! 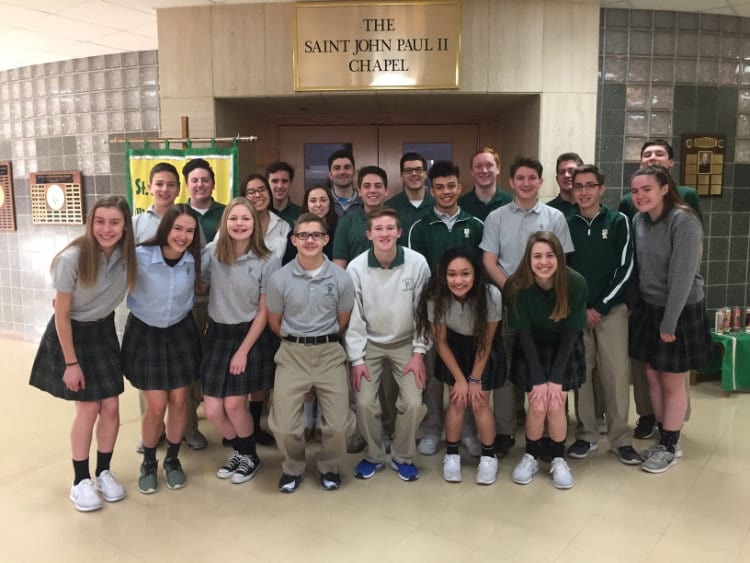 St. Edward will now offer quarter zip pullovers as an option to wear with the school uniform. The quarter zips are available to purchase through the school office before or after school at a cost of $30. Order forms may be turned in to the school office with payment. 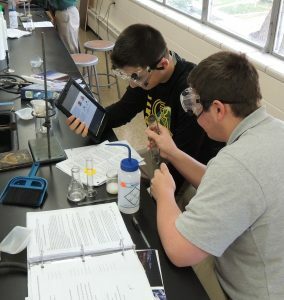 The quarter zips are not required; they are an option for students. No other quarter zips may be worn with the uniform except these. Samples for sizing and for students and parents to view are available in the Main Office. Please contact the us with any questions. 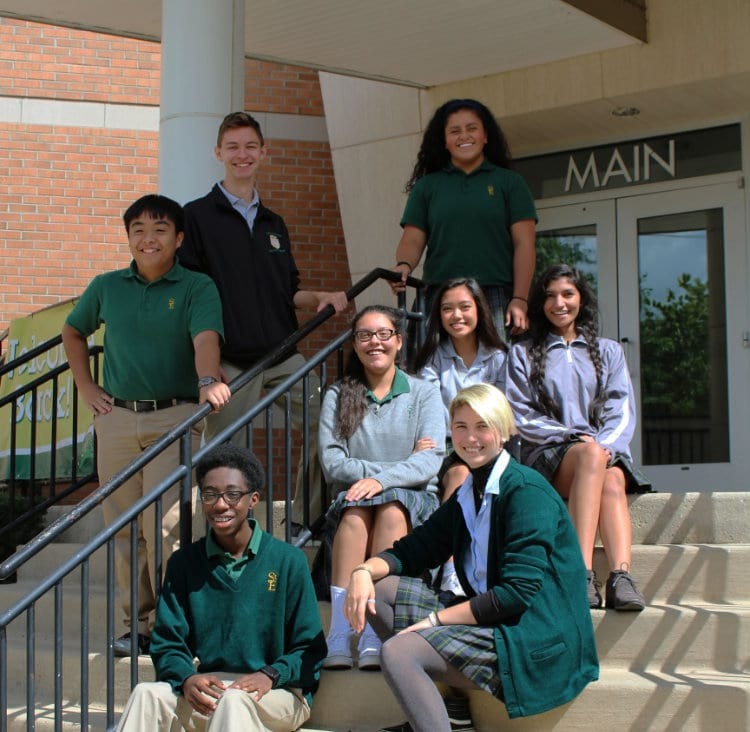 Polo: Green or grey short sleeve polo style uniform shirt with required St. Edward Green Wave logo. Polo shirts are only allowed during 1st and 4th quarters of the school year, and must be tucked in at the waist. 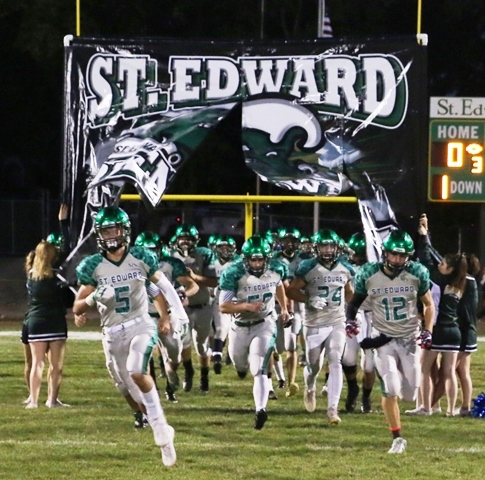 Oxford: White, light blue, or yellow oxford style uniform shirt (long or short sleeve) with required St. Edward Green Wave logo. Oxford shirt must be tucked in. Pants: Blue or khaki colored uniform pants with required St. Edward “STE” monogram. Skirt Grey/green/gold uniform plaid skirt with hem line no higher than 1” above the knee. Shirt must be tucked in so skirt waistband is visible (no blousing of the shirt). 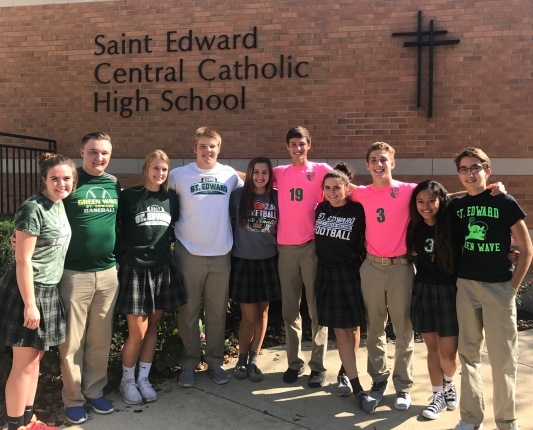 Sweater: Optional green or grey uniform v-neck sweater with required St. Edward Green Wave logo, during 2nd and 3rd quarter. Socks: Solid colored socks coordinating with the uniform. Socks must be above the ankle but below the knee. Solid colored, conventional tights are acceptable. Footless tights are not permitted. Shoes: Dress or athletic shoes coordinating with the uniform. Shoes must have a back. Shoes must be neat and clean in appearance. Polo: Green or grey short sleeve polo style uniform shirt with required St. Edward Green Wave logo. Polo shirts are only allowed during 1st and 4th quarters of the school year. Polo shirts are to be worn only with uniform pants and must be tucked in. Oxford: White or light blue oxford style uniform shirt (long or short sleeve) with required St. Edward Green Wave logo. Oxford shirt must be tucked in. Tie: Ties must be worn up to the neck. No wording or pictures on ties allowed. Ties may not be distracting or disrespectful. Sweater: Optional green or grey uniform v-neck sweater with required St. Edward Green Wave logo during 2nd and 3rd quarter. Socks: Solid color socks coordinating with the uniform. *Students are expected to be neat in their appearance at all times, and uniform clothing must be in original repair. *All other applicable regulations from the dress code apply. *Administration reserves the right to decide acceptability. at anytime. All shoes must have a back. Girl’s pants may not be altered to where the pants are tight fitting. The correct size uniform pants must be worn. “Baggy” style and oversize pants are not permitted. Pants should be properly worn at the waist and not at the hips. No hats are to be worn in the building at any time. Kerchiefs, headbands, or other ornaments considered against dress code by the administration is unacceptable. Straps, chains, rock buttons, medallions, cultic, rope necklaces, excessive wrist bands and excessive jewelry is unacceptable. One wrist band may be worn. No other body piercing is acceptable. Tattoos, temporary or permanent, are strongly discouraged. Any permanent tattoos must be covered. Boys are to be clean shaven (no mustaches or beards) with side burns no lower than the bottom of the ear. Boy’s hairstyles must be off the forehead, above the collar, and off the ears. Military haircuts are acceptable.